EPW061200 ENGLAND (1939). The town centre, Slough, 1939. This image has been produced from a damaged negative. 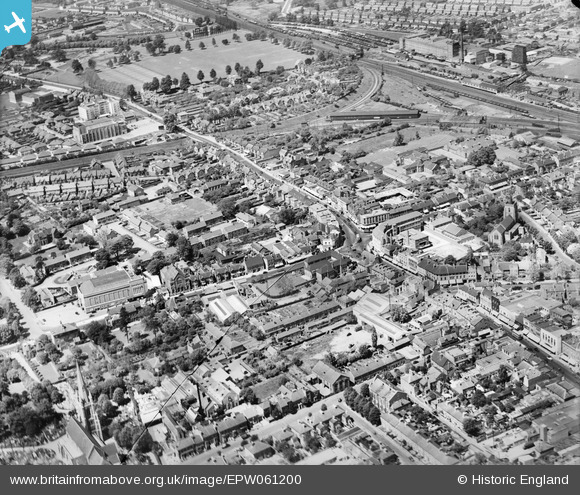 Pennawd [EPW061200] The town centre, Slough, 1939. This image has been produced from a damaged negative. I was born in 1945 in the Maternity Unit in Burlington Avenue; I assume this is the building in question. Is this the building opened in 1930 by Lady Astor? The site is now occupied by a care Home. This building and the one to the north are marked as schools on the old Ordnance Survey Maps. I assume they both belong to the Slough Secondary School - co-educational - that was opened in 1912 and enlarged in 1914. This information was obtained from Maxwell Fraser's history of Slough Schools -http://www.sloughhistoryonline.org.uk. They were split into the Boys' Grammar School in Lascelles Road in 1936, and the Girls' High School in Twinches Lane in 1940. I was born in this house September 1939.